FIGURE 8.2 Common designs of solar stills. used, then that type of solar still is known as a passive solar still. Types of solar stills available in literature are conventional solar stills, a single-slope solar still with passive condenser, a double-condensing chamber solar still, a vertical solar still (Kiatsiriroat, 1989), a conical solar still (Tleimat and Howe, 1967), an inverted absorber solar still (Suneja and Tiwari, 1999), and a multiple-effect solar still (Adhikari et al., 1995; Tanaka et al., 2000a; 2000b). Other researchers used different techniques to increase the production of stills. Rajvanshi (1981) used various dyes to enhance performance. These dyes darken the water and increase its solar radiation absorptivity. With the use of black napthalamine at a concentration of 172.5 ppm, the still output could be increased by as much as 29%. The use of these dyes is safe because evaporation in the still occurs at 60°C, whereas the boiling point of the dye is 180°C. Akinsete and Duru (1979) increased the production of a still by lining its bed with charcoal. The presence of charcoal leads to a marked reduction in start-up time. Capillary action by the charcoal partially immersed in a liquid and its reasonably black color and surface roughness reduce the system thermal inertia. Lobo and Araujo (1978) developed a two-basin solar still. This still provides a 40-55% increase in the freshwater produced as compared to a standard still, depending on the intensity of solar radiation. The idea is to use two stills, one on top of the other, the top one made completely from glass or plastic and separated into small partitions. Similar results were obtained by Al-Karaghouli and Alnaser (2004a; 2004b), who compared the performance of single- and double-basin solar stills. Frick and Sommerfeld (1973), Sodha et al. (1981), and Tiwari (1984) developed a simple multiple-wick-type solar still, in which blackened wet jute cloth forms the liquid surface. Jute cloth pieces of increasing lengths were used, separated by thin black polyethylene sheets resting on foam insulation. Their upper edges were dipped in a saline water tank, where capillary suction provided a thin liquid sheet on the cloth, which was evaporated by solar energy. The results showed a 4% increase in still efficiency above conventional stills. FIGURE 8.3 Schematic of a cascaded solar still. Evidently the distance of the gap between the evaporator tray and the condensing surface (glass cover) has a considerable influence on the performance of a solar still that increases with decreasing gap distance. This led to the development of a different category of solar stills, the cascaded-type solar still (Satcunanathan and Hanses, 1973). This consists mainly of shallow pools of water arranged in a cascade, as shown in Figure 8.3, covered by a slopping transparent enclosure. The evaporator tray is usually made of a piece of corrugated aluminum sheet (similar to the one used for roofing) painted flat black. 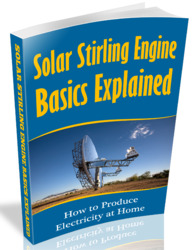 Thermodynamic and economic analysis of solar stills is given by Goosen et al. (2000). 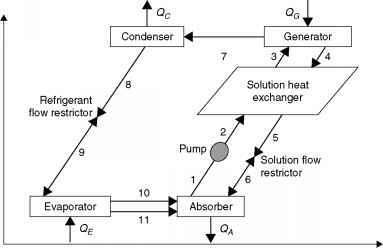 Boeher (1989) reported on a high-efficiency water distillation of humid air with heat recovery, with a capacity range of 2-20 m3/d. Solar still designs in which the evaporation and condensing zones are separated are described in Hussain and Rahim (2001) and El-Bahi and Inan (1999). In addition, a device that uses a "capillary film distiller" was implemented by Bouchekima et al. (2001) and a solar still integrated in a greenhouse roof was reported by Chaibi (2000). Active solar stills in which the distillation temperature is increased by flat-plate collectors connected to the stills are described by Kumar and Tiwari (1998), Sodha and Adhikari (1990), and Voropoulos et al. (2001). Solar stills are the most widely analyzed desalination systems. The performance of a conventional solar distillation system can be predicted by various methods, such as computer simulation, periodic and transient analysis, iteration methods, and numerical methods. In most of these methods, the basic internal heat and mass transfer relations, given by Dunkle (1961), are used. k where d = average spacing between water and glass surfaces (m). k = thermal conductivity of humid air (W/m-°C). C = constant. " = constant. Gr = Grashof number (dimensionless). Pr = Prandl number (dimensionless).